Hollington United became the first team through to the Hastings & District FA Intermediate Cup semi-finals. The Lions edged out fellow Macron East Sussex Football League Premier high-flyers Rye Town 1-0 in a closely-contested quarter-final at Gibbons Field on Saturday. Action from the Hastings & District FA Intermediate Cup quarter-final between Hollington United and Rye Town. Hollington, who are still unbeaten in all competitions this season, prevailed thanks to a solitary second half goal from Jan Bailey. More than half of the day’s scheduled action involving East Sussex League clubs did go ahead, though. Two quarter-finals were played in the Hastings & District FA Junior Cup and the semi-final line-up in the top half of the draw is now complete. Division One leaders Northiam 75 scraped past visitors Hollington United II, who are fifth in Division Two, 5-4 in a nine-goal thriller. The prolific Scott Embery was Northiam’s hero with a hat-trick, while Oscar Garcia Cruz and Stephen Housago were also on target for the winners. Northiam’s reward is a home last four meeting with Peche Hill Select, who edged out fellow Division Two side Bexhill United II 3-2 in another tight tussle. A Sam Harris-Green double and one from Joe Worsley proved just enough for Peche Hill to overcome a Bexhill side whose goals were scored by Daniel Smith and Ben Packer. Two games were also played in the Hastings & District FA Lower Divisions Cup, albeit this time in opposite sides of the draw. Division Five leaders Sedlescombe Rangers III produced a tremendous turnaround from 2-0 down at half time to win 5-2 against a Robertsbridge United II team lying sixth in the same division. In a match switched to Bexhill Road with The Clappers pitch unfit, goals from William Barden and Robert Cauvain gave Robertsbridge a deserved half time advantage, which could’ve been greater had they not missed a penalty. But Sedlescombe were level within 10 minutes of the restart and struck three times thereafter to set up a last four trip to Division Four outfit Cranbrook Town. A Philip Hatch hat-trick, a debut goal for young Kyle Parslow and a Stephen Davey penalty put Sedlescombe through. At the bottom of the draw, Division Four side West Hill United won 4-1 away to Division Five club AFC Hollington to set up a semi-final away to Battle Baptists III or Northiam 75 II, whose tie was postponed. As for the league, nine matches were played across the top five divisions. The one Premier Division encounter ended in a 1-1 draw between Sidley United and Hawkhurst United - two teams who have risen to fourth and fifth respectively at the front of a queue of four clubs level on points. Rosh Wells gave Sidley an early lead with a low drive from 25 yards, but Robert Guile’s second half equaliser earned Hawkhurst a point. Three games were played in Division One and Bexhill AAC began their quest to reel in leaders Northiam with a 3-0 victory at home to Hastings Rangers. Strikes by Craig Ray and a beauty from Andy Atkin put AAC two-up at half time in their first league fixture since October, and Daniel Goergen added the third. In another match switched to Bexhill Road, Rangers had a first half penalty saved and AAC finished with 10 men. AAC are up to third in the table - nine points behind Northiam having played five fewer matches. Wadhurst United went fourth on the back of a 3-2 success away to Little Common II. The goals of Matt Harman, Harry Bateman and Anthony Allder won it for Wadhurst, despite Jordan Harris netting twice for Common. The JC Tackleway rose to sixth after a Jordan Harley hat-trick helped them to a 6-0 win away to Rock-a-Nore. One goal each from Joseph Adams, Josh Eaton and Harry Blunden completed Tackleway’s most emphatic victory of the season. Mayfield climbed a place to seventh in Division Two courtesy of a 1-0 victory at home to a Bexhill Rovers side which remains bottom. Simon Betteridge grabbed the all-important goal. The top two in Division Three went head-to-head and leaders Punnetts Town preserved their 100 percent record with a 2-1 win away to Sedlescombe Rangers II. Clinton Smith netted for Sedlescombe, who now trail Punnetts by five points having played three more games. Punnetts have won all 13 of their league fixtures so far and now need just two more points from their remaining five matches to secure the title. Sandhurst, who like Sedlescombe have just two league games remaining, jumped up two places to third via an 8-1 victory at home to Ticehurst. Craig Walsh plundered a hat-trick, James Found bagged a brace, and there was one apiece for Harry Young, Andrew Turner and Daniel Vousden. Ben Turk netted Ticehurst’s consolation. The top two in Division Four both won, so Orington remain two points clear of Bexhill AAC II having played an extra match. 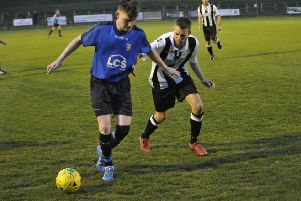 Orington prevailed 4-3 against fifth-placed Sovereign Saints II in a game switched to the 3G pitch at Bexhill College. Strikes by Nick Sheppard (2), Scott Quested and Thomas Blything proved just enough for the leaders, who were pushed all the way by a Vince Rembridge double and one from George Wheeler. Playing for the first time in more than two months, Bexhill AAC II showed few signs of rustiness as they won 4-0 away to Burwash. Ian Rise (2), Scott Oliver and Matt Simmons were the scorers. League matches are scheduled for all six divisions this coming Saturday, along with games in various cup competitions, including Battle Baptists’ National Christian Cup quarter-final away to Selhurst United.